Incidentally, the squirrels are not related to anything in this post, except them being topsy turvy and willy nilly. I love how the snow and sunflower seed were caught mid air in this shot. I had enough participants and seeds for two separate rounds, each with over 50 seed packets. (Yep, that was how I spent my Sunday.) I sent them off to what I'm calling Team Muhly and Team Bee Balm on Monday. I make a point of being positive and humorous online, but it turns out I'm human (nooooo!). I seem to have come down with a major case of the January blahs. Not in terms of hating winter, as I love winter, especially this early in the season and especially with the snow cover we have. It's that a lot of November and December was fun and busy with holiday activities and other diversions. And now things have slowed down into a big, dull blah. And as a diversion from feeling blahy, I've branched out into feeling grumbly (all I need now is an Old Fogey button and to yell at kids to get off my lawn). I have spent a lot of time recently on the phone with customer "service" people, trying to explain and resolve what should be (but aren't) straight-forward inquiries. Lots of being passed on to other people (once seven times, only to end up where I started, though with a different person, who did finally address my issue!) and getting contradictory information. But I'm hoping that's settled now. Does anyone know how to remove "Read more!" links added automatically by Blogger? For some reason, Blogger has automatically added "Read more!" links at the end of every single one of my posts (old and new)! Only there is nothing more to read, and I really want to remove these links. I'm using the old editor, and can see no code for these links in html mode, so I can't remove them. Has this happened to anyone else? Update: Thanks to Premarati who suggested I look at the HTML template (which I forgot existed, even though I've edited it in the past!) and Garden Girl whose comment made me go back and re-read something I thought I'd read clearly enough the first time, but had not! It turns out the reason I couldn't see the jump code in my template was because I had not clicked the Expand Widget Templates option so I could see all of the template. I then found the code I added years ago, before Blogger had the automatic "read more" feature, and could delete it. I think that when Blogger added its "read more" feature, it took my old template command (which previously was used only when called out/coded in individual posts) to mean I wanted every single post to end in "read more" automatically. Yay! Problem solved. Does anyone know how to delete a blog from Blotanical? I'm trying to remove my older blog, Full Bloom, which has been inactive for over a year. I can see no option under MyBlogs to remove it. Update: Thanks to Barbee and others, I'm pretty sure we cannot remove blogs from Blotanical, only Stuart can. I've emailed my request. Thanks! What do you to do distract yourself from blahs and grumblies?? Hang in there Monica. Spring is near the seed swap should divert you a bit. 50 participants is a lot! P.S. I get a kick each time I see a red or black squirrel. We don't have them here where I live. Monica, I may be wrong, but I think you have to notify Stuart to remove that old blog from Blotanical. I know he did one for me a few years ago. 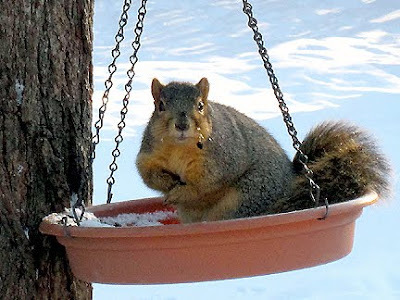 Hi Monica.....your squirrel is gorgeous......so chunky....and I love the seed in the air....what a good shot. What do I do? Visit you! :-) I've been a little blah for the same reasons... glad I'm in good company! How did the walk go?? What do I do to distract myself from the blahs??? I drink a lot! NO - That was a lie! I don't drink (much). Hmmmm ..... I watch a lot of trash TV so I can see human beings whose lives are worse than mine; I also read lots of distracting trashy novels; and I cry often and for no reason. But even better than all the above, I try to get out for a walk and I talk to friends who always make me laugh. Yes, in only 2 months, the sun will arrive and little green things will begin sprouting and the blahs will go away! Hang in there! To distract myself from the grumblies I watch The Big Bang Theory! And I get on with the tasks I know I should be doing, but which may be a little daunting. Then have a talk/laugh with my various favourite people - which includes reading my fave blogs - of which yours is one. I had a case of the winter blahs last week, too, but I started looking through your book on Winter Sowing and planning some seed purchases--both of those helped! I'm afraid there's no cure for customer service syndrome, though; I have been known to fume after one of those calls for hours. Hope you get your answer to the Blogger issue; I have a bunch myself I should throw out there sometime, like why does the spacing never look the same on my editor as on the final post?? Perhaps the "Read More" button should say "Read Again"! When I click on: Read More, it just opens the list of comments, same as clicking on the word: Comments. Somehow some wires have gotten crossed it seems. Sorry I don't know how to help you. Love the squirrel shots! I wish I could help with the "Read More" thing, although "Read More!" is always good advice. Have you looked at Settings as well as Layout? Going for a walk sounds like a good way to shake off the blahs. There's still too much snow here for that, so I've been burying my nose in a good book, which at the moment are ones by Walter Moers. Make me wish I could read German. I think your idea of walking to do errands will be most beneficial to you. Being outside always helps my frame of mind. Your squirrels are cute. We have mostly grey squirrels in our garden. 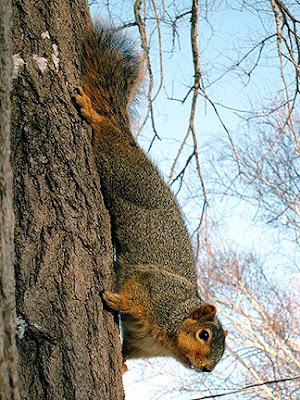 I like the larger Fox Squirrels. At least they add a little color to your garden. I've had a serious case of the blahs for a week or so now.I put it down to not working for 5 weeks and not getting the old exercise endorphins going ...but perhaps it is just seasonal blah - or my age! Hubby recently bought me a full stream ionizing light to use. My sleep schedule is so wacked it's not even funny. It's hard to get up at 7 to move the horses when not getting to sleep until 2. Both the light and the ions are supposed to help with the winter blahs. I'd like to use the light a lot more than half an hour. I keep being reminded of the Northern Exposure episode where Holling got addicted to his full-spectrum light that he wore on his visor. The best advice I can give besides a full-spectrum light and even more seed swapping is to get outside whenever there is sun -- I know that can be very difficult in the frozen North. Hope that work got rid of the January blahs Monica and if not it will soon be time for February frolics:) Hope that you can get your Blotanical/Blotanical queries sorted - it's all a mystery to me. I just got back from the post office where I stood in line for an hour because they only had one person working at the stand. Anyway, I took out oat+wheat cat grass. I added in a couple of commercial seed packets from ReneesGarden.com I had laying about and added in a small pack of my climbing nasturtiums. It is on its way to N.C.
PS I got the seeds today. Thanks!! Love the squirrel photos-not winter blahs for them. I shall have to remember those othe titles if and when I feel up to posting again. I am afraid the blahs are running deep with me this winter. :( But talking gardening and planning gardening trips with Rose has inspired me to at least get back to reading and commenting. Can't wait to get the seeds! Monica, I know what you mean. After all the hustle and bustle of the holidays, January has always been somewhat of a letdown. No one wants to return to work so everyone's grumpy. So I almost always have a party of some kind in this month. Gives everyone something to look forward to and lifts the spirits somewhat. Try it! Sorry, I don't know what blogger is doing to you! I think I might be able to help you get rid of the 'read more' thingie. On your 'Customize' page, go to 'Page Elements," and click on the 'Edit' link at the bottom of the blog posts box. Near the top of that page (titled Main Page Options,) the second choice is 'Post Page Link Text.' Note the orange question mark - you can click on that for more information on this feature, and hopefully get rid of it from there. Hope this helps! I'm one nut who loves 'time out' January, Monica. Time to organize my life (inside/out) and catch up; however, have done none of the above this month :) Becoming good friends with my new iMac and the learning curve from a PC has been somewhat grumpy challenging but fun! Great pics of the squirrel...ahhh! You better not be grumbly tomorrow when we go on our mini road trip! :-) Can't guarantee that we'll see anything green or garden-related to chase the blahs away, but at least it'll be above freezing - a virtual heat wave! And just think - three months from today your forsythia will be in bloom (assuming you have a forsythia - I do, and it always blooms in time for Tax Day). I feel you pain...the 'blahs' pain that is. I did just pull some hyacinth bulbs out of the cold storage to force and I even found some forcing vases at one garden center. I'm thinking of putting that third bulb in a waterford glass. That should work and it makes me smile. It's amazing but this year mom doesn't seem to have the January blahs. We'll see what February will be like! We hope you're doing better and are busily sowing aways those Winter seeds. Here's for a nice weekend! I have been going into my vault of photos and playing with color in photoshop and staging vinettes and such and taking photos..passes the time and gives me photos to post and talk about! Seeing that I'm am nesting indoors as I heal from surgery I'm playing ..almost feels like I'm coloring in a coloring book. * weeks until Spring! Hang in in there Monica!Your grumpiness shall pass!